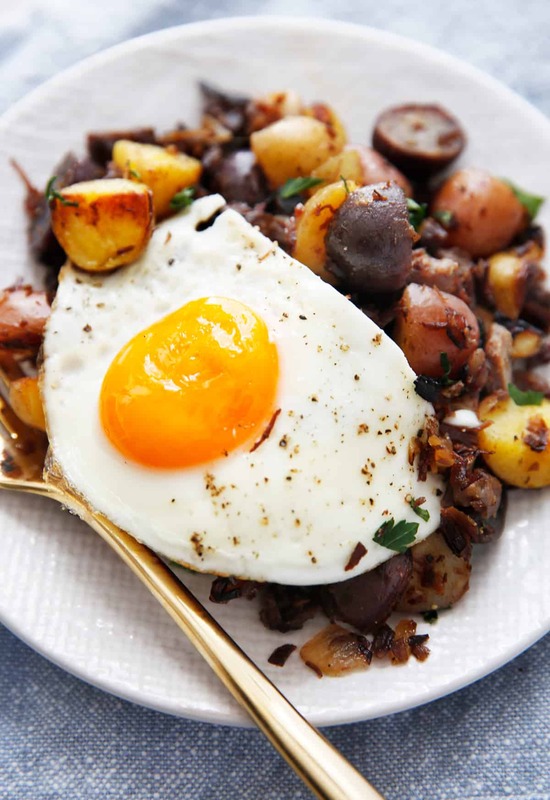 This Easy Corned Beef Hash is the best way to use up leftover corned beef OR the best excuse to make corned beef from scratch! It’s a simple dish that is hearty and comforting, made under 20 minutes with only a handful of ingredients. Top with a fried egg, a splash of hot sauce and this gluten-free and paleo and whole30-friendly breakfast is ready! 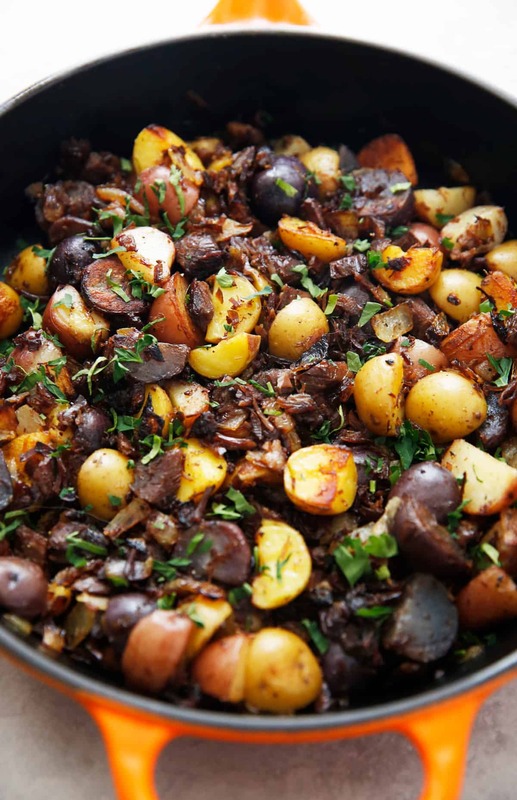 We don’t know what we look forward to more when it comes to St. Patrick’s Day eats, the actual Corned Beef and Cabbage or the subsequent leftover meal that follows: this Easy Corned Beef Hash. 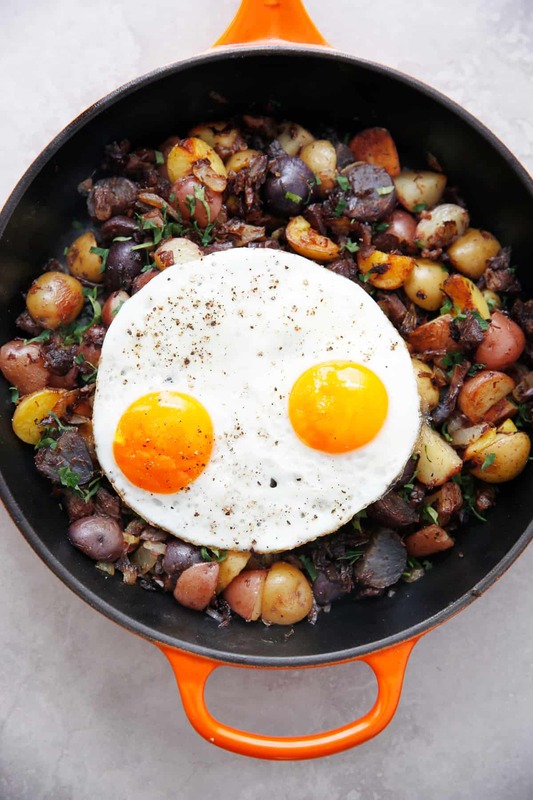 It’s such a hearty, comforting breakfast: meat, potato and eggs. 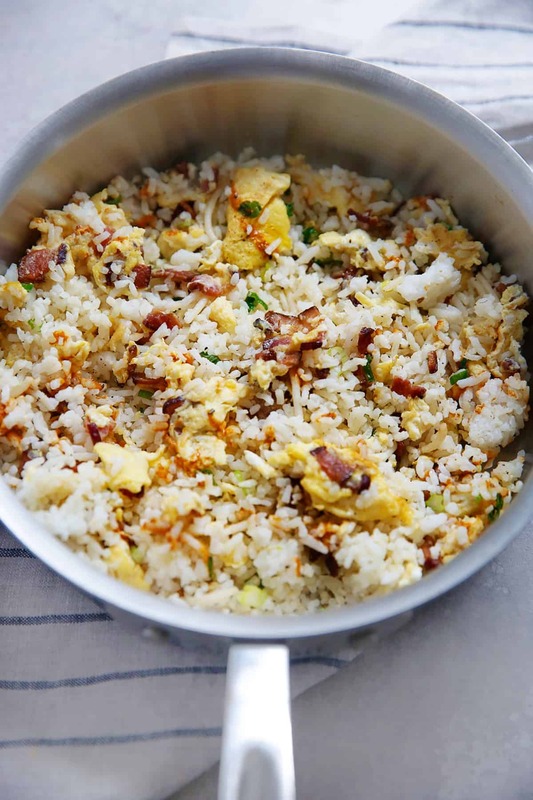 It’s such a classic meal and the best part is that the components are mostly already cooked so it’s just a matter of heating them all up together and topping with an egg, if desired. 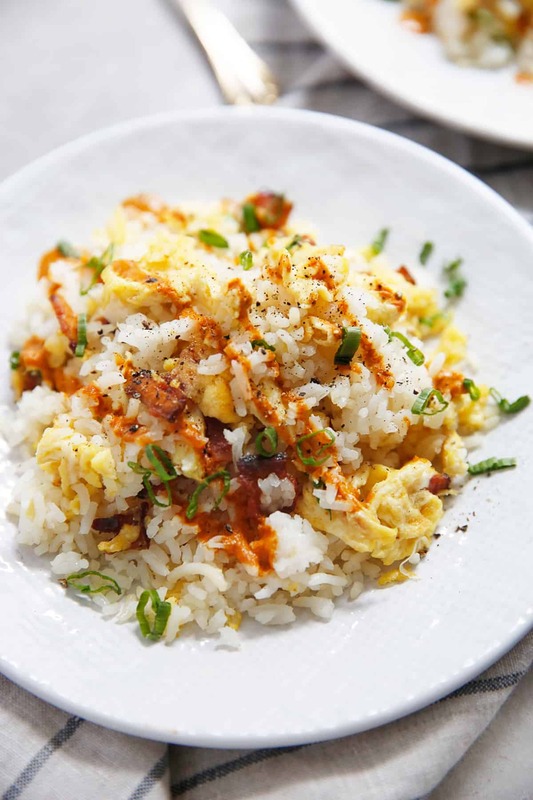 If you don’t have leftover corned beef laying around, trust us this breakfast is totally worth cooking corned beef for. This is one of those recipes that really is more of a guideline. If you have leftover carrots, or onions or root vegetables that were cooked with your corned beef you can feel free to add those in! This can also work with any other leftover beef you may have, though it won’t have that classic flavor as it does when cooked with the corned beef. If you have leftover roast beef, pot roast or even steak, you can make this work. If you don’t have any leftover potatoes you can cook up some fresh. Just dice up some potatoes and boil for about 12-15 minutes, or until fork tender. They brown better when they are cold, but fresh cooked will work in a pinch. Season with garlic powder and pepper, and add salt if needed. Why is corned beef so salty? We talk extensively about the process for brining your own corned beef here, and then go into details about how to cook it from scratch here. If cooked properly (meaning rinsed really well and cooked in enough water) corned beef shouldn’t be overly salty, but when making corned beef hash you definitely want to taste the dish before adding any additional salt! Heat a large cast iron or non-stick skillet over medium heat. Once hot add oil and onion. Cook until soften, about 8 minutes. Add butter to the pan and turn up heat to medium high. Add beef and potato and stir to combine. Then let cook, undisturbed for 5 minutes. Flip over the hash and cook on the other side for another 5 minutes, or until the hash is heated through. This can also work with some other cooked cuts of beef like brisket or pot roast. To make fully dairy free feel free to sub in ghee or additional oil in place of the butter. If you are using an oven proof skillet you can also crack a few eggs inside of the hash after step 2 and cook under the broiler for a few minutes until the eggs are cooked! This holiday season it is time to get fancy because we’re showing you How to Make Creme Brulee! This dairy-free and refined-sugar free version is just as decadent as the classic version but lightened up with a secret healthy ingredient! 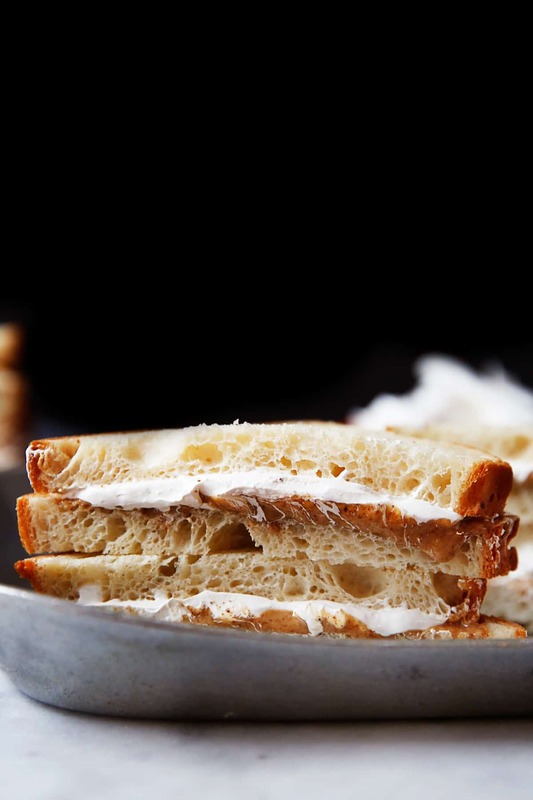 It’s perfectly sweetened with a blend of honey and maple sugar and despite it feeling fancy it is really easy to make! We’re showing you all the tips and tricks to place this spectacular dessert on your table this holiday season! Made in partnership with my friends at Vital Proteins! Today we’re talking about How to Make Creme Brûlée because holidays are made for this special treat! But I’m here to let you in on a little secret: it’s really easy to make! 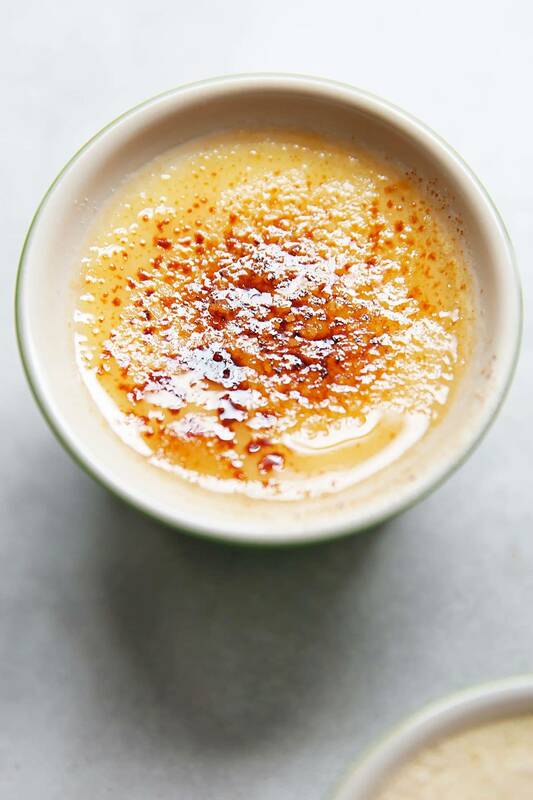 Creme Brulee is just simply a custard baked in the oven and topped with caramelized sugar. See? When you spell it out that way, it sounds so SIMPLE (it is)! 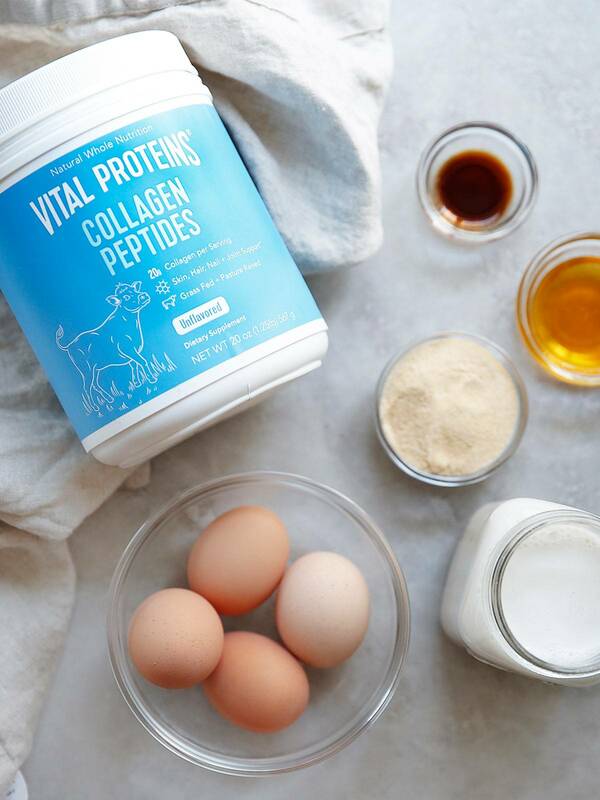 We made our lightened up version a little extra special with the addition of my favorite Vital Proteins Collagen Peptides. Nobody will know it’s there but it gives your dessert a little extra boost of health benefits! Great for your hair, nails, skin, gut, and so much more- it’s the perfect sneaky addition! Let’s talk about custard. Custard is essentially just a liquid mixture that uses eggs to set up that is baked slowly and gently in the oven. Traditionally custard uses dairy milk and heavy cream as it’s base, but we’re using a mixture of almond milk and coconut cream. We didn’t want the Creme Brûlée to take on too much of the taste of coconut so we found the balance of those two really allowed the vanilla flavor to shine through without any coconut interferrence. 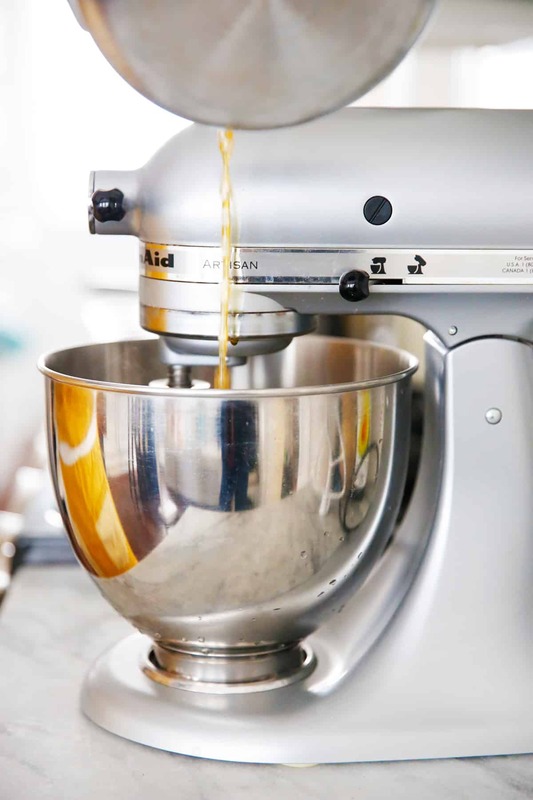 Similarly we used a blend of maple sugar and honey as a sweetener for the same reason, using only one ran the risk of taking on too much of that flavor. You’ll need the maple sugar for the caramelized sugar on the top too at the end! Our Creme Brûlée is JUST sweet enough, but if you prefer your desserts on the sweeter side you can add an extra 2 tablespoons of honey. To make the custard you must first temper the eggs. All this means is that you are going to gently warm up the liquid and slowly ladle and whisk it into the eggs. The reason for doing all of this is so that the custard bakes evenly in the oven. 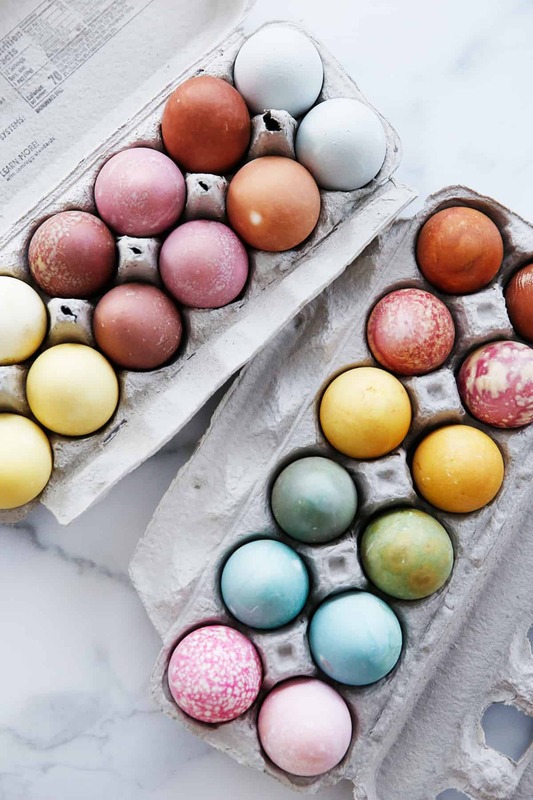 You want to make sure you do not scramble your eggs, so do not boil the liquid mixture and then dump it all in to the egg mixture all at once–you’ll end up with cooked eggs! If your mixture has a lot of froth (from over-mixing) a great trick is to use your kitchen torch and very quickly turn it on and burn off the bubbles. It takes just one second or so and they pop and disappear making for a smooth custard (and it is kind of fun)! After you’ve tempered the eggs and added in all the ingredients you’re going to cook these custards slowly and gently in the oven. This means using a water bath! You’ll want divide the custard mixture into 4-6-ounce ramekins that are placed in a roasting pan. In the roasting pan you’ll pour in hot water to come up the sides of the ramekins by about half way. Bake in the oven until the custard is just set! This means the outside edges are set but the middle part is still a little wobbly. Once they’re cooked through let them cool down slightly and then let them chill in the refrigerator until they’re just set. You can do this 1-2 days ahead of time. 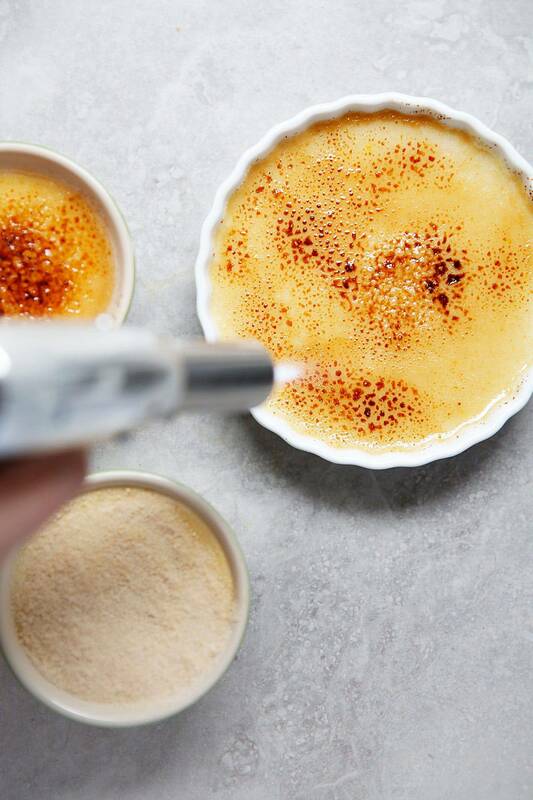 Once your custards are completely set and you are ready to serve the creme brûlée you’ll want to put about 1 scant teaspoon of maple sugar on top and shake it gently until the sugar is even. 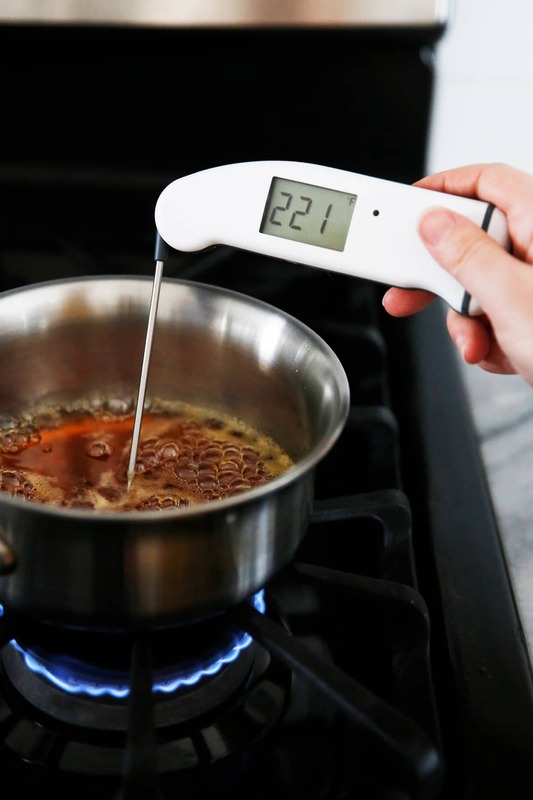 Light up your kitchen torch and begin to caramelize the sugar! Set the flame a few inches from the sugar and let it slowly go from light brown to darker brown, but do not let it go so long that it turns black. The sugar will harden once it cools after a minute or two. Serve right away so there is still that nice crunch on top! I am so excited to bring you today’s recipe with a little sneaky favorite ingredient of mine! My love for collagen peptides is well documented, and I never tire of ways to make it part of my daily routine. I use it in my coffee each morning, but there are so many ways to use it because it totally dissolves and is tasteless. 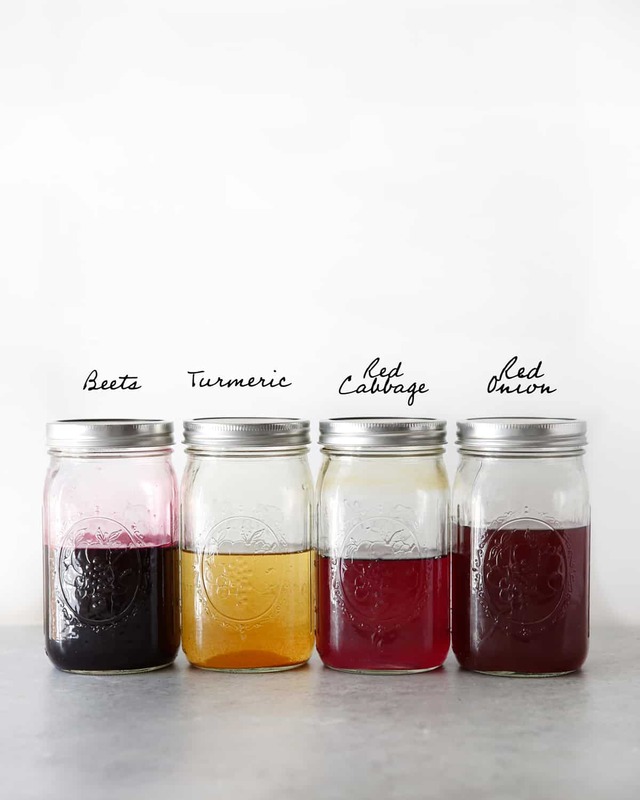 Adding collagen to your diet can be a great way to improve and promote bone and joint health, aid in healthy digestion and gut health, improve sleep and nourish your skin. 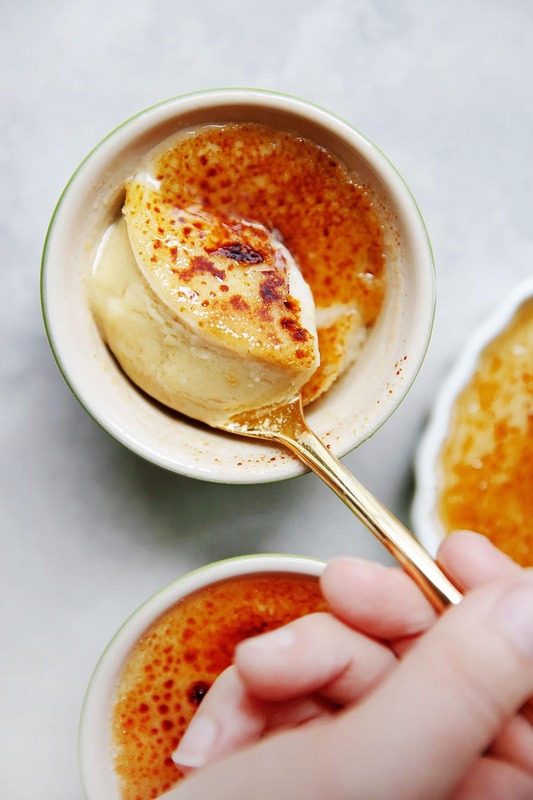 It can be added to just about anything including this Creme Brûlée recipe! Preheat oven 325ºF. Place 4 - 6 ounce ramekins in a roasting pan. In a pot heat coconut cream and almond milk until about to steam, to about 150ºF. In a large bowl whisk together eggs, yolks, honey, maple sugar and salt until they are fully combined. 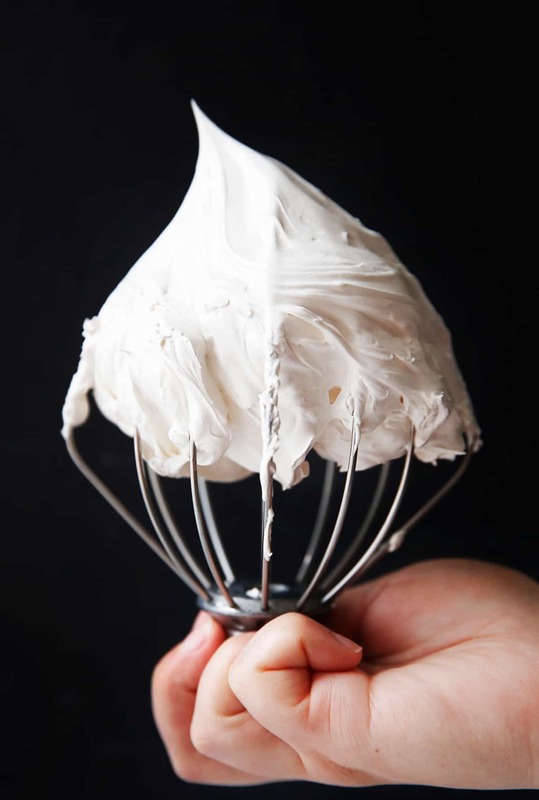 Temper the eggs: Using a ladle slowly pour a little of the hot cream at a time to the eggs while continually whisking, until all of the cream is combined. Divide into ramekins and place in the oven. Carefully pour hot water (very hot tap water is fine) into the roasting pan until it reaches halfway up the side of the ramekins. Bake until the outside of the custard is just set with still slightly wobble in the middle, about 35-40 minutes (see note). Let cool to room temperature and then chill in the refrigerator until completely set, at least 2 hours or up to 2 days. Right before ready to serve, evenly sprinkle a thin coat of maple sugar, about 1 teaspoon, on top of custard. Using a kitchen torch melt the sugar until caramelized. Coconut cream is the thick non-liquid separated portion in coconut milk. You can buy either full-fat coconut milk and just scoop of the top until you reach one cup, or you can purchase coconut cream, just take care to leave behind any liquid at the bottom of the can. Either one needs to be thoroughly chilled before you scoop off the coconut cream for at at least 12 hours in the refrigerator. This creme brûlée is just sweet enough, but if you prefer your custard more on the sweet side add up to 2 more tablespoons of honey. If you bake your creme brûlée in smaller sized ramekins your baking time will be shorter so watch carefully for the just set outside but still wobbly middle. 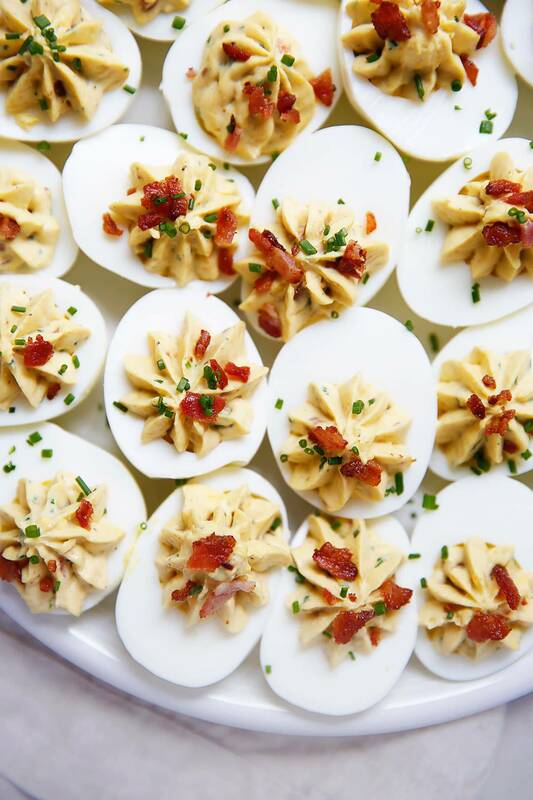 These Deviled Eggs with Bacon and Chives are your answer for an easy-to-make appetizer to please a crowd! They are so delicious and can even be made ahead of time! 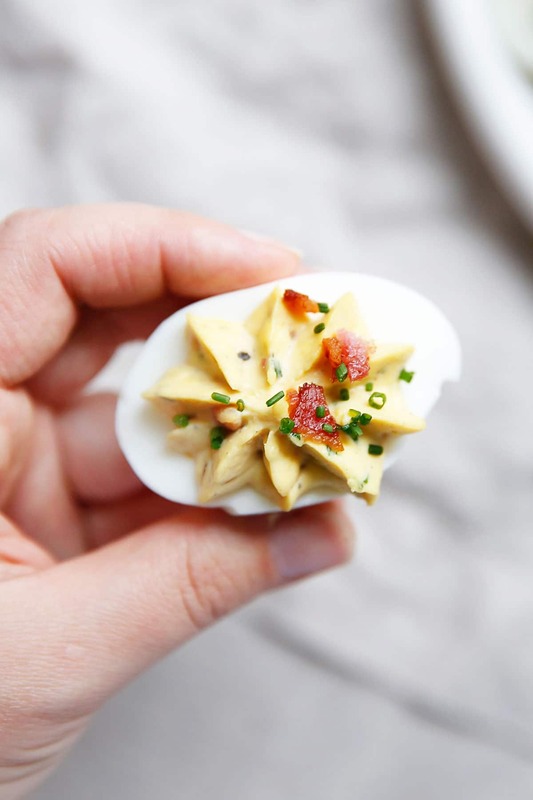 The addition of bacon and chives bump these deviled eggs up to the next level! These are great to serve during the holidays but also make a great protein filled snack for any time of year and are compatible with Keto, Paleo and Whole30 diets! This Deviled Eggs with Bacon and Chives recipe is the perfect savory treat to make or bring along to your next holiday gathering! 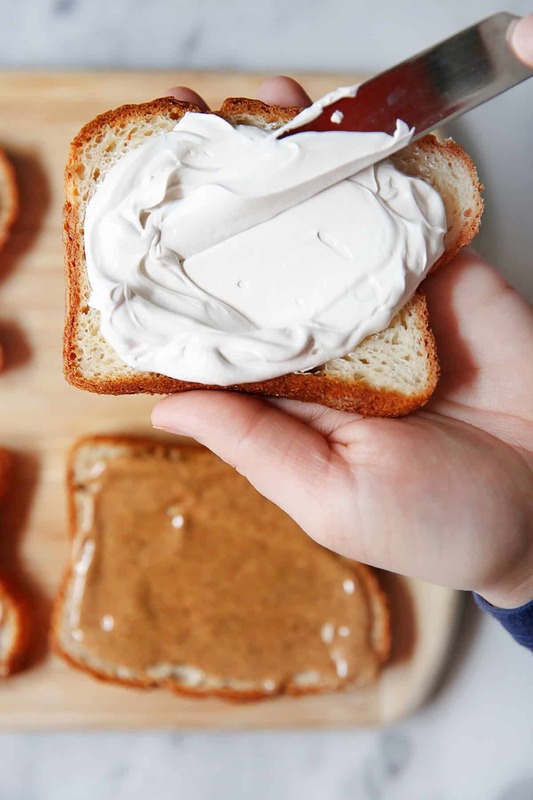 They’re simple to prepare and can be made ahead of time clearing out your schedule during this busy time! The bacon and chives really add something special to this classic deviled egg and we know they’re going to be your new favorite! They are also great to have for the upcoming new year as everybody gives a new diet a try! You can have one or two (or ok… three) for a protein fueled snack and feel satisfied for a few hours until your next meal. This recipe is compatible with Keto, Whole30 (make sure you are using compliant bacon) and Paleo diets. And they are super delicious! 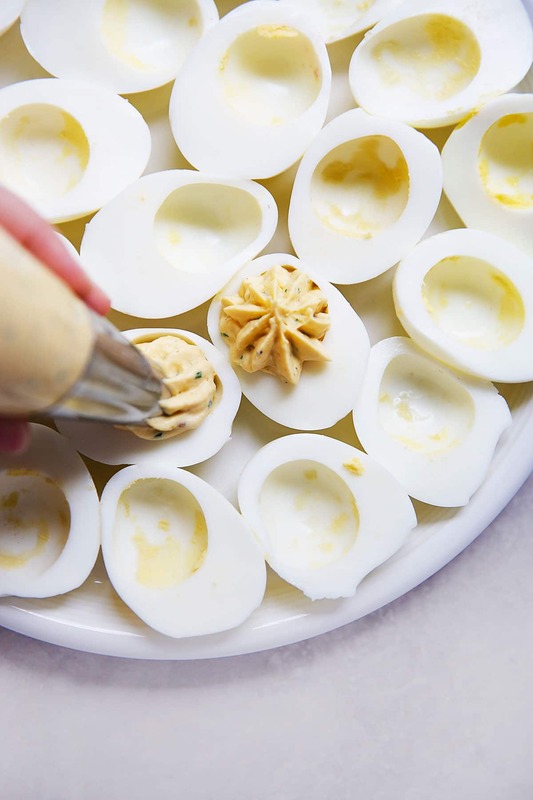 We can’t talk about deviled eggs without talking about how to make the perfect hard-boiled eggs! If you are like me, you’ve tried EVERY method for boiling eggs and always fallen short. That is until I was introduced to the steaming method. 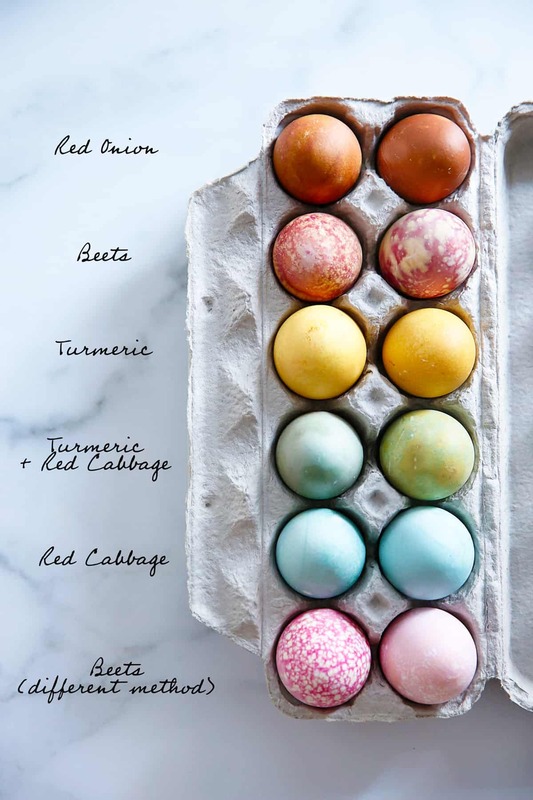 Steaming eggs leaves them perfect every time, and incredibly easy to peel. You can steam eggs on both the stove top and using the Instant Pot. Using the Instant Pot to cook hardboiled eggs is 100%, hands-down, my first choice because the shells peel off so easily! 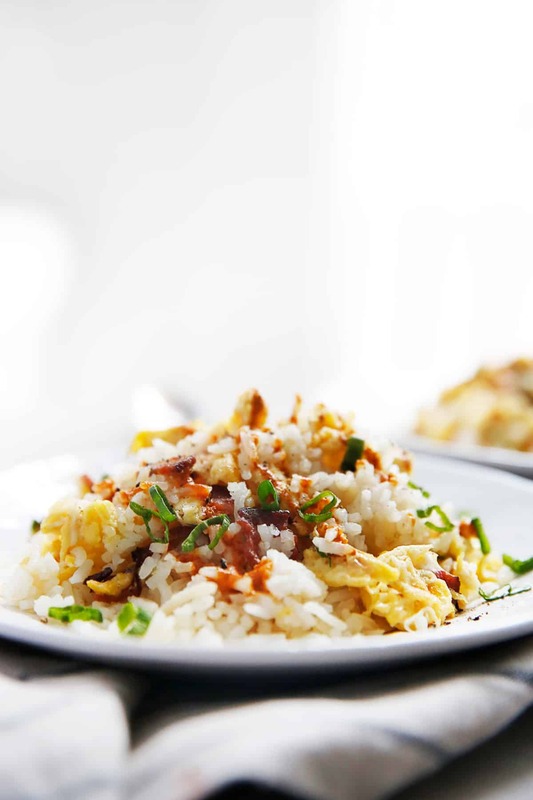 If you haven’t tried cooking eggs in the pressure cooker, be prepared to be amazed! As you can see, we piped our filling, which makes them look extra fancy, but have no fear, you don’t need to if you don’t have the tools! You can fill up a plastic bag with the egg yolk filling and snip the end to pipe, or you can use a small spoon to scoop up something filling and use a second spoon to knock the filling in place! Deviled eggs can be prepared up to two days ahead of time. Wrap the egg white halves well and keep the egg yolk filling sealed in a resealable plastic bag with all the air squeezed out! If desired you can keep the filling separate and pipe into eggs right before serving. ButcherBox delivers your meat for the month, saves you money, and is the best quality! Enjoy the best 100% chicken and meat, while getting free bacon & $15 off your first ButcherBox! 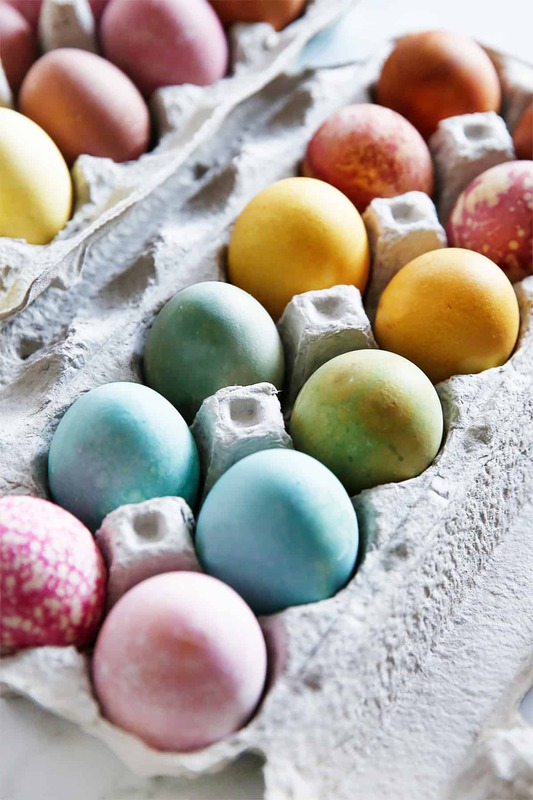 Peel and slice the eggs in half lengthwise and take the yolks out and place into a mixing bowl. Place the egg whites on a serving platter and set aside. Using a potato masher or fork, mash the egg yolks into a uniform paste. Add cooked bacon, mayo, 1 tablespoon chives, dijon mustard, vinegar, garlic powder, black pepper and combine. Check the seasoning and add salt if desired. 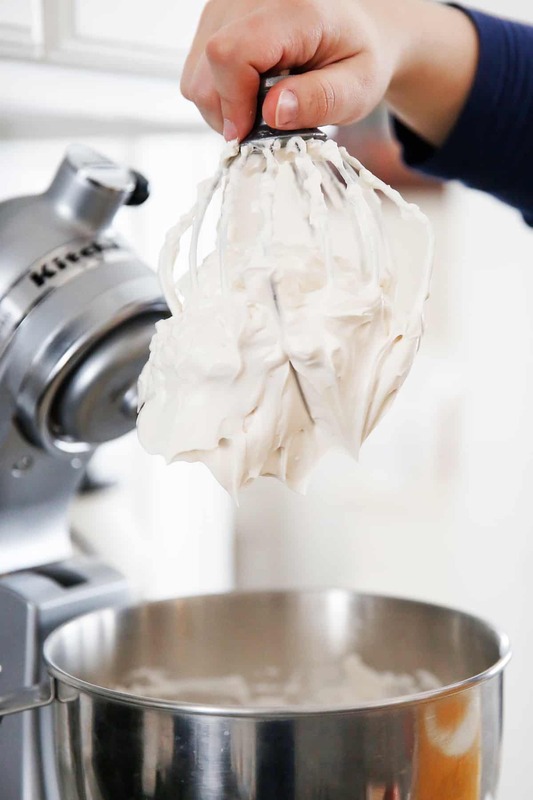 Place the ﬁlling into a piping bag and pipe into the center of the egg whites. If following a special diet such as Whole30 check to make sure the bacon you use is compliant. This recipe serves a crowd! If you don't need to, feel free to halve the recipe for weekly snacks! We recommend two ways to hard boil eggs: in the Instant Pot or Steaming on the stove. Check out these posts for directions on both. Deviled eggs can be prepared up to two days ahead of time. If desired you can keep the filling separate and pipe into eggs right before serving.